The crime-infested intersection of West Fayette and Monroe Streets is well-known--and cautiously avoided--by most of Baltimore. But this notorious corner's 24-hour open-air drug market provides the economic fuel for a dying neighborhood. David Simon, an award-winning author and crime reporter, and Edward Burns, a 20-year veteran of the urban drug war, tell the chilling story of this desolate crossroad. Through the eyes of one broken family--two drug-addicted adults and their smart, vulnerable 15-year-old son, DeAndre McCollough, Simon and Burns examine the sinister realities of inner cities across the country and unflinchingly assess why law enforcement policies, moral crusades, and the welfare system have accomplished so little. This extraordinary book is a crucial look at the price of the drug culture and the poignant scenes of hope, caring, and love that astonishingly rise in the midst of a place America has abandoned. DAVID SIMON is the creator of the HBO television series, The Wire for which he served as executive producer, head writer, and show runner for all five seasons. He is also is the author of the bestselling Homicide: A Year on the Killing Streets, which won an Edgar Award and inspired Barry Levinson's Emmy Award-winning television program of the same name. A freelance writer based in Baltimore, he is also a writer and producer for Homicide and received the 1994 Writer's Guild for America Award for outstanding script in an episodic television drama. A teacher in the Baltimore public school system, Edward Burns retired after serving twenty years in the city police department. For much of that time, he worked as a detective in the homicide unit. 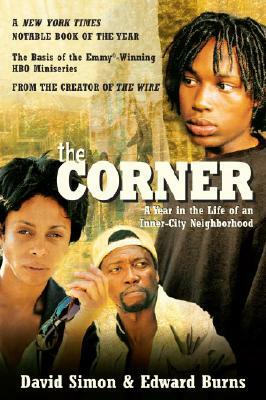 "The Corner is an intimate, intense dispatch from the broken heart of urban America. It is impossible to read these pages and not feel stunned at the high price, in human potential, in thwarted aspirations, that simple survival on the streets of West Baltimore demands of its citizens. An important document, as devastating as it is lucid." "The Corner is a remarkable book--very tough, very demanding, very rewarding. Some of it is brutal and all of it is heartbreaking. As a reporter, I can only stand back and admire David Simon and Edward Burns for an amazing piece of reportage. To be there for an entire year, to make sense of random events and a list of characters long enough to make Charles Dickens envious, and to write coherently--it's a breathtaking achievement. And they manage to make West Baltimore as much a character as any of the flesh-and-blood people in the book." "If you want to understand street-corner life in the inner city, you should read The Corner, an amazingly intimate, detailed work of reporting that makes human and vivid a world that outsiders ordinarily are forced to learn about through statistics, sound bites, and stereotypes."